Scrub and peel the sweet potatoes. Cut the potatoes into 1-inch cubes. Place the sweet potatoes and oil in a large bowl. Use a spoon to stir and toss sweet potatoes to cover with oil. Spread sweet potatoes on a large baking sheet. Bake in preheated oven until potatoes are browned and tender, about 20 minutes. Remove potatoes from the oven and cool. Place roasted sweet potatoes, roasted corn, white beans, avocado, jalapeno and tomatoes and the red wine vinaigrette into a large bowl. 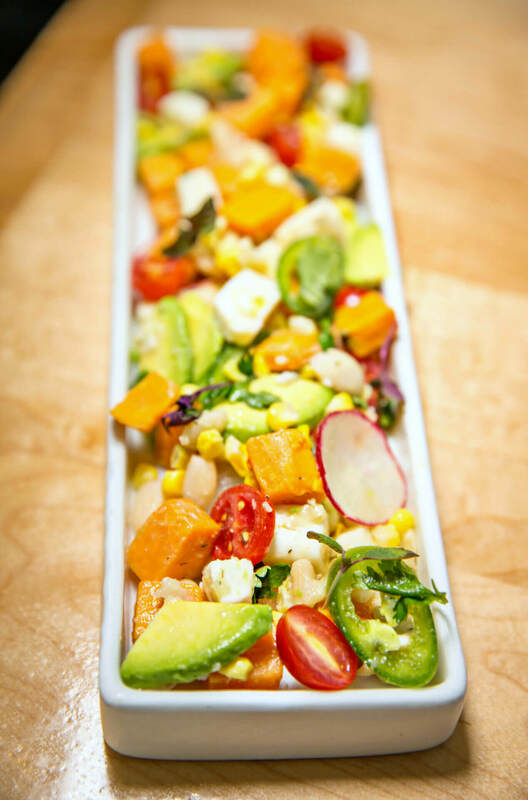 Gently toss to coat the vegetables with the dressing, being careful not to mash avocados. Divide mixture among two serving dishes. Scatter queso fresco over the salads.